This is now week 2, and everything except the cilantro is emerging. I'm pleasantly surprised at the progress so far in just a few days. The AreoGarden makes sense to me. 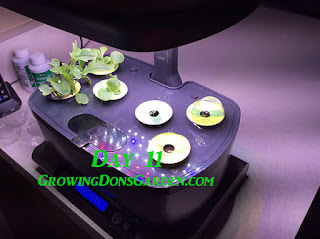 I remember seeing the Epcot display of hydroponic gardening, and it always intrigued me. So far, I've not added any water to the unit. It has taken a little bit, but not enough for me to add more. It still has a few days before I need to add nutrients so I will check the water level at that time. The Baby Greens are indeed growing faster than the other stuff. I'm guessing now that I'll have to prune those back while the other plants catch up. Temperatures this week have been on the cold side as we've been running the heat in our house. Yes, we live in Florida where we hardly run the heat. Most of the time, we're running the air conditioning, but it is winter and December here in central Florida. 12/14/17 - Day 8: Mint is now emerging. Waiting for Cilantro. 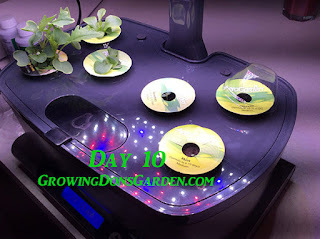 12/15/17 - Day 9: Cilantro not up. Condensation forming on little domes. 12/16/17 - Day 10: Cilantro not up. Not sure it is going to make it. 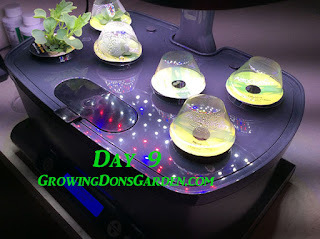 12/17/17 - Day 11: Baby Greens are growing quickly. Cilantro a no! 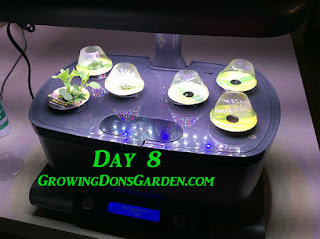 12/19/17 - Day 13: Took dome off cilantro. May not emerge. I'm a massage therapist specializing in the mind/body connection who is also a computer techie and in my spare time I enjoy being creative in life especially with my music and writing. I love to play in my garden. I've been on Oprah, Dr Drew, CNN, and the NASA Tweetup (Grail Mission).